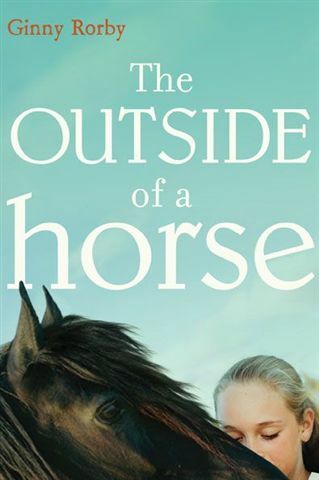 Woven from true events, The Outside of a Horse is the story of a daughter's struggle to help her war veteran father deal with his wounds and PTSD through their shared love of horses. My first horse was a mop with reins. This tire was my second. The stories Hannah Gale’s father told her of breaking wild horses in Nevada one summer when he was just her age have captured her imagination. After her dad is called up to fight in Iraq, she feels most deeply connected to him when she is watching the horses at a nearby stable, and finally gathers her nerve to ask the owner for a job. There, she helps bring a rescued mare back from the brink, takes her first riding lesson, and witnesses the birth of the filly who steals her heart. Hannah believes the worst is over, when her dad returns from war, but soon she realizes her family’s fight is only just beginning. When his nightmares rock the household it is the horses she turns to for comfort. But it is not until she discovers the true gift a relationship with horses can give, does she think they may be the way to help her father heal. She becomes convinced that horses can teach her dad the same lessons of survival and hope they’ve taught her, but only if she can get him to give them a chance. Based on a patchwork of true stories, this is a heartbreaking story about rehabilitative power of animals, and the depth of the human capacity for hope—and for love. I love this review best. My former best friend (who has abandoned me for a life of heavy eyeliner and break-up songs) and I were scoping through our Scholastic Book Fair a while back (when we were still in good terms). There were little to no horse books there due to the fact we were in middle school and most girls had grown out of that stereotypical pony-loving stage. But not us. While searching for that gem in the rough, we simultaneously spotted your novel, The Outside of a Horse, and bought a copy. Now I am 13 and in the 8th grade. For years I have stifled my love of writing out of doubt; saying you want to be a writer when you grow up is an un-anchored ambition. I still am wary of my ability to support myself financially with my writing, but was recently encouraged by one of my teachers. Do you have any advice for an aspiring writer? I know it is hard to recall effort after being relinquished from its hardships, but any word from you would mean a lot to me. Can an adult horse survive after losing a leg?